Research is proving that the outdoor fitness equipment found in fitness parks for adults are providing a variety of meaningful outcomes to communities including engaging participants in substantially more moderate to vigorous physical activity. With the steady and dramatic rise in adult obesity, promoting regular physical activity is a public health priority. It is time to think about new ways to make physical activity and fitness equipment more affordable, more enjoyable, and ultimately, more beneficial to society. Research is proving that the use of outdoor fitness equipment found in Fitness Parks for adults are providing a variety of meaningful outcomes to communities including engaging participants in substantially more moderate to vigorous physical activity. Together we can effectively promote the benefits of parks and outdoor fitness spaces as critical health solutions, by reducing sedentary-related illnesses and removing the barriers to a life of fitness. Outdoor gyms are located all across the country. Use our fitness park map to find a park with outdoor fitness equipment near you. 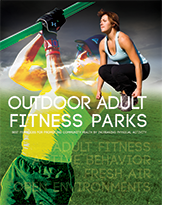 Request the 62 page guidebook that demonstrates through case studies and research how fitness parks containing outdoor fitness equipment improve community wellness; as well as the laying out the design considerations and planning needed to implement a well-rounded adult fitness park. If you are ready to start your community fitness park and would like someone to help you create an outdoor gym in your city, click here and we'll have someone contact you to help with planning, fitness equipment selection, funding resources, and other ways to make your project a success.